I loved John Gaventa’s book on power. I read it a good while ago, but it came to me as I read more and more about social movement analysis that it would be good to look at it again — and the more I love it. Because it does not start from the question of why do people organise and challenge power, but from the question of why they don’t do it more often. It looks to the question: what is that nature of power? Bases its analysis not on Foucault, but on Steven Lukes in Power: A Radical View, and the way this debate on power has expanded C. Wright Mills. This definition is focused on behaviour, on doing, on participating. We know the list: apathy, political inefficacy, cynicism or alienation…amoral familism (I think I knew that was on the list). Groups do sometimes rise up, fight back. Something else must be going, so we move to the two-dimensional approach, introduced by Schattschneider, further developed by Bachrach and Baratz (again, none of whom I have read). A exercises power over B when A affects B in a manner contrary to B’s interests. A may exercise power over B by getting him to do what he does not want to do, but he also exercises power over him by influencing, shaping or determining his very wants. the analysis of power must avoid the individualistic, behavioural confines of the one- and to some extent the two-dimensional approaches. It must allow ‘for consideration of the many ways in which the potential issues are kept out of politics, whether through the operation of social forces and institutional practices or through individuals’ decisions…the three-dimensional view … offers the prospect of a serious sociological and not merely personalized explanation of how political systems prevent demands from becoming political issues or even from being made. this allows considerations of social forces and historical patterns involved in hegemony per Gramsci, and Ralph Milliband’s work on the engineering of consent (in The State in Capitalist Society which I maybe should read). Some of the forms of non-decision making: force, threat of sanctions, invocations of norms and precedents, manipulation of symbols (like ‘communist’ and ‘troublemaker’), establishing of new barriers. These are easily identifiable, others exist that are not so observable, like institutional inaction, or B deciding not to make a demand of A for fear of anticipated reactions. Their identification, one suspects, involves specifying the means through which power influences, shapes or determines conceptions of the necessities, possibilities, and strategies of challenge in situations of latent conflict. Thus we have direct and observable forms: control of information, mass media, processes of socialization. Indirect: psychological adaptations to the state of being without power, adaptive responses to continual defeat, extensive fatalism, self-deprecation, undue apathy. Greater susceptibility to internalization of values and beliefs. 3 — to posit or participate in ideas or actions which speculate about or attempt to develop challenges — response will shower if power relations operating (27). 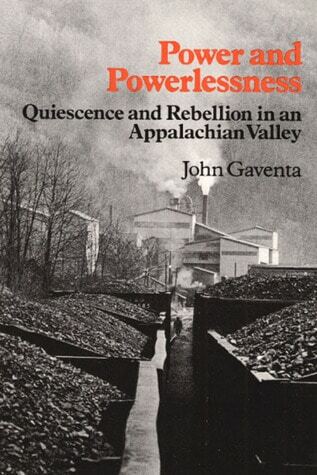 To illustrate both this understanding of power and this method of its study, Gaventa then goes on to destroy any possible belief that the ‘acquiescence’ of coal miners in the Appalachians is due to their own lack of intelligence, culture or because they are happy and smiling in their work. connected to socializing influences of government, church and school controlled by the Company. Gaventa continues through the historical formation that elads us to the present. After the initial boom and destruction of previous ways of life and though came the rise of unionisation, the violence of its destruction, and the maintenance of power relationships into the present (of the book’s writing of course). He gives several case studies. Throughout the book Gaventa focused on the articulation of structure and culture (though articulation is not a word he uses, and comes of course from Stuart Hall, but this is exactly the relationship Hall is trying to examine as well). He looks at how local politics is entirely within the control of the power structure. He returns to the various approaches to power and how they illuminate current conditions, showing the interrelated nature of these forms of exercising power. He ends with an account of a current (1980) struggle, a campaign that began organizing around garbage collection, then started to move towards land reform given that the land was not owned by those who lived or worked there, but by people living far away. Those in struggle found that this was the crux of the problem. You want to see power relations in action, you try such a challenge. Gaventa describes the repression they faced: twenty-bullets through a community worker’s home, office of health and development group burned down, alternative school also destroyed by fire (214). People branded as communists, ignored by local government and agencies. A later campaign against the multinational company owning the land couldn’t even discover where ownership actually resided, much less how to make them accountable. Only as these multiple aspects of powerlessness are overcome may the conflict that emerges in power’s first dimension be said to be amongst relatively competing groups, upon clearly conceived interests, in an open arena.